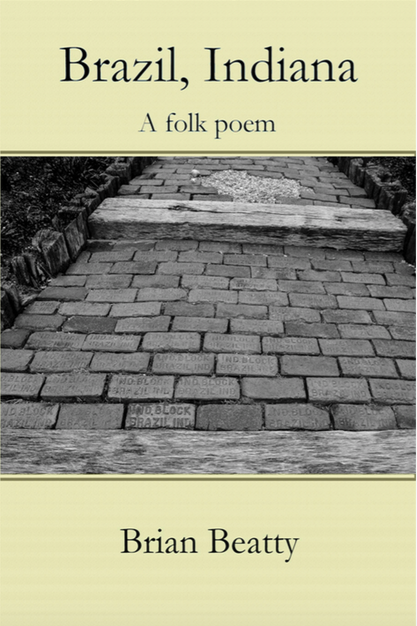 Brazil, Indiana: A Folk Poem (book) – Brian Beatty: Writer. Jokester. Bearder. A book-length sequence of 12-line lyrics honoring the people and places of my youth. Excerpts appeared in print and online publications around the world. Brazil, Indiana, is so much more than the crazed crazy quilt of fringed, frayed, fabricated dry goods of unique voice and character scored with the sore ache of waking life in the heart of the heart of the country. It’s a whirligig of worries and wonders, set piece work wigwagging out waves of distress, waves of warning, erratic centripetal directions on how to go nowhere fast. A testimony to an era, to things hidden from public view, the people behind a home’s kitchen curtains or a barn’s swinging door. Every town should be lucky enough to have such a skilled, perceptive narrator. Dad said Carl Sandburg was the only poet he understood. I’m starting to feel that way about Brian Beatty.